The iPhone 5 is an example of Apple's pattern of using iPhones with full model numbers to introduce major new features. For instance, the iPhone 4 and 4S both use essentially the same design, while it's immediately clear that the iPhone 5 is different from those models. The most obvious change is that its screen is larger—4-inches as opposed to the 4S's 3.5-inch display—and thus the phone is taller. But it's more than just a larger screen that sets the iPhone 5 apart from its predecessors. There are a number of under-the-hood improvements that make it a solid upgrade. 4-inch Retina Display screen at 1136 x 640 pixels. All previous iPhones had 3.5-inch screens. Like earlier Retina Displays, this screen packs in 326 pixels per inch. The Apple A6 processor. The iPhone 5 is the first Apple device that uses this processor, which the company claims offer twice the performance of the A5 chip in the iPhone 4S. 4G LTE networking support and support for DC-HSDPA networks. Dual-band 802.11n Wi-Fi (support for 2.4GHz and 5GHz networks). Lightning connector. This smaller, reversible connector uses just 9 pins as opposed to the earlier 30-pin connector, allowing for a thinner phone. Other elements of the phone are the same as on the iPhone 4S, including FaceTime support, A-GPS, Bluetooth, audio and video support, and more. Like previous models, the iPhone 5 has two cameras, one on its back and the other facing the user for FaceTime video chats. While the back camera in the iPhone 5 offers 8-megapixel photos and the ability to record in 1080p HD like its predecessor, a number of things are different about it. Thanks to new hardware—including a sapphire lens and the A6 processor—Apple claims that photos taken with this camera are more faithful to true colors, are captured up to 40% faster, and are better in low-light situations. It also adds support for panoramic photos of up to 28 megapixels, created via software. The user-facing FaceTime camera is substantially upgraded. It now offers 720p HD video and 1.2-megapixel photos. Apple-created Maps app, including turn-by-turn GPS navigation. FaceTime over cellular networks, where available. Without the carrier subsidy, prices are US$449, $549, and $649. 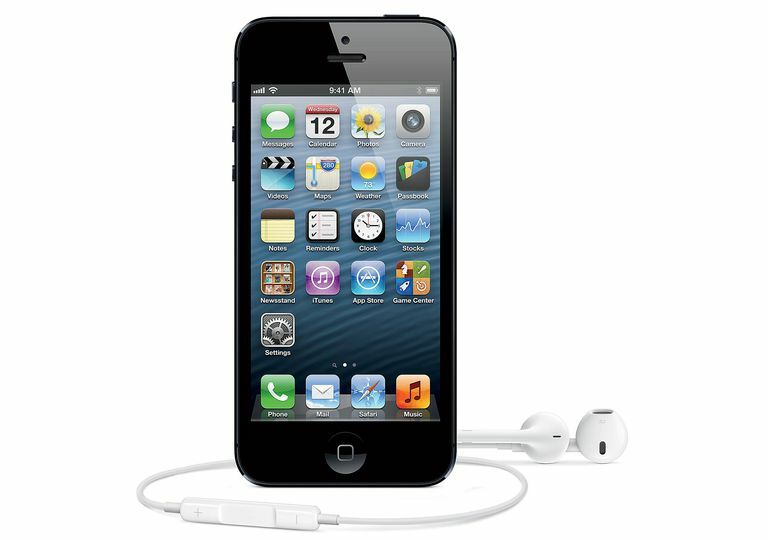 The iPhone 5 ships with Apple's EarPods earbuds, which are new with the devices released in fall 2012. EarPods are designed to fit more securely in the user's ear and provide better sound quality, according to Apple. Release date: Sept. 21, 2012, in U.S., Canada, Australia, United Kingdom, France, Germany, Japan, Hong Kong, and Singapore. The iPhone 5 will debut on Sept 28, 2012, in Austria, Belgium, Czech Republic, Denmark, Estonia, Finland, Hungary, Ireland, Italy, Liechtenstein, Lithuania, Luxembourg, Netherlands, New Zealand, Norway, Poland, Portugal, Slovakia, Slovenia, Spain, Sweden, and Switzerland. The phone will be available in 100 countries by December 2012. In keeping with the pattern established with the iPhone 4S, the introduction of the iPhone 5 doesn't mean that all earlier models have been discontinued. While the iPhone 3GS was retired with this introduction, the iPhone 4S and iPhone 4 are still being sold. The 4S will be available for $99 in a 16 GB model, while the 8 GB iPhone 4 is now free with a two-year contract.